The Katana-Air is the world’s first totally wireless guitar amplifier, designed for maximum comfort and convenience when playing at home. It features BOSS’s new high-performance wireless guitar technology for cable-free playing and comes loaded with versatile amp sounds and a huge range of effects derived from our stage-class Katana amplifiers. And with onboard Bluetooth, you can use your phone or tablet to load up effects, edit sounds, and jam along with your favorite music without ever moving from your playing spot! The Katana-Air delivers big sound with up to 30 watts of power and is equipped with a stereo speaker system that provides extra depth and dimension when using stereo effects like chorus and reverb. It also sounds fantastic for normal music playback, allowing the amp to do double-duty as a Bluetooth sound system. The amp even runs on batteries, enabling you to play just about anywhere, indoors or out. If you’re like most guitarists, you’re likely to play more often when all you have to do is grab your instrument and go. But if you need to set up a bunch of stuff first, you might be inclined to skip it altogether and head straight for the TV, particularly after a long day at work. The Katana-Air solves this problem because it’s always ready to play, and you don’t even have to mess with a single guitar cable. Just remove the transmitter from its charging dock in the amp, plug it into your axe, and start jamming for up to 12 hours on a single charge. The Katana-Air’s transmitter docks in the amp for charging and automatically establishing the wireless connection. What’s super-cool is that the transmitter automatically goes to sleep when you stop playing for a while, conserving the charge time. This allows you to leave it plugged into your guitar and ready for the next playing session, whether that’s an hour later or a few days later. And as soon as you pick up the guitar, a motion sensor wakes up the transmitter and amp, so you can start playing straight away. You don’t even have to push a power button. It doesn’t get any more convenient than that! Recently developed by BOSS, the Katana-Air’s innovative wireless guitar technology sounds great, and actually provides better tone quality than using a standard cable. It’s also lightning-fast, so you’ll never experience any lag when playing. Better still, the Katana-Air requires none of the fussy setup issues that make other wireless guitar systems difficult to use. The amp has a docking port for the transmitter, which provides charging for the transmitter battery. While docked, it also scans wireless frequencies to find the optimum connection, so all you have to do is plug and play. BOSS’s stage-class Katana amps have been hugely successful, thanks to their winning mix of versatile amp tones, onboard effects, and great Tube Logic feel. With all the same sound-shaping features found in the Katana Version 2 amplifiers, the Katana-Air delivers premium tones for playing all styles, from light jazz to ultra-heavy rock. There’s even an amp type that’s optimized for use with acoustic-electric guitars. On top of that, you get integrated access to over 50 BOSS effects, plus six panel memories for storing favorite amp and effects setups. The Katana-Air has a panel layout that’s very similar to the stage-class Katana amplifiers. What good is a wireless amp with lots of sounds and effects if you have to walk over and adjust panel settings every time you want to change things up? That’s where the BOSS Tone Studio app comes in. This powerful editor/librarian provides a friendly interface for operating the Katana-Air from your iOS or Android device via Bluetooth, and is filled with lots of deep-dive parameters not available from the amp’s panel. With the app, you can choose from a history of BOSS effects, from overdrives and distortions to phaser, flanger, delay, reverb, pitch-shifting, and many more. Each effect also includes a full set of parameters to adjust them just how you like. Of course, you have full remote control of the five amp types and tone stack as well. After you’ve dialed in your sound, just save it as a Tone Setting for instant recall later. You’re able to save a nearly unlimited number of Tone Settings in the app, and load any six into the amp at once for quick one-touch access. With the BOSS Tone Studio app, you’re able to wirelessly control all Katana-Air parameters from your iOS or Android mobile device. Sounds like a pretty cool amp, right? To find out more, visit the Katana-Air product page at the BOSS website. 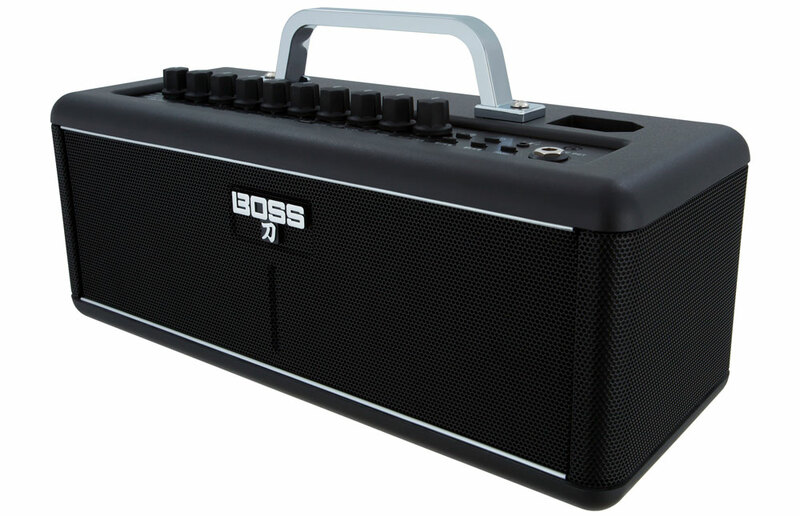 The innovative, easy-to-use BOSS wireless technology in the Katana-Air is also found in the WL series, a new line of wireless systems for guitars, basses, and nearly any electronic musical instrument. Learn more about these cool wireless systems in this in-depth article.